Before the first use : wash each piece with warm soapy water, rinse thoroughly and dry. Towel drying immediately after washing will maintain the finish and eliminate water spots * Match the cookware piece to the size of the burner. Always make sure that the flame touches the bottom of the cookware only. Use low to medium heat and always wash thoroughly after every use. Never use empty pot/pour water or food particles before switch on the stove. Low to medium heat may offer the best cooking performance. Use high heat only for boiling or reducing liquids. 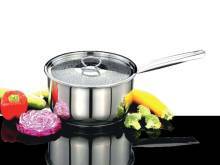 Un-dissolvable salts will "pit" stainless steel surfaces. 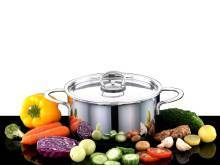 Stainless Steel is not recommended for prolonged use or storage of salty, highly acidic foods or beverages (i.e. pickling). Please use plastic coated or wooden spatulas. 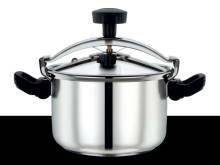 Avoid using metal spatulas or sharp instruments or appliances to cut, chop or whip foods in the cookware vessel. 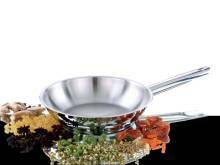 Such use can damage the coating (if applicable) or deeply scratch the surface of the interior of the pan. Dishwasher-safe but for best results hand washing is recommended. 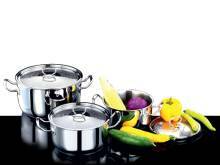 Wash cookware immediately after each use. Food build-up may occur if pans are not cleaned promptly. 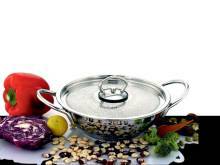 Always place cookware on a firm, flat surface. Do not use scissors, knives or other sharp objects because they will damage the surface of the cookware and void your warranty. 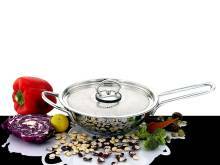 Discoloration (blue or grayish stains) may occur when cooking starchy food at high temperature. Use baking soda and water to remove buildup. To keep the surface smooth and scratch-free, do not use abrasives, bleach or ammonia. Do not use steel wool. Do not use harsh detergents or cleansers with chlorine bleach. 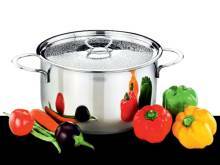 Do not allow the cookware to heat up to high temperatures while empty. Always add food, water, oil, etc. when in use. To remove the burnt food from pan, cover the stuck foodstuffs with warm soapy water, allow to soak for some time, then boil for 10 minutes, allow it to cool, then use a soft cloth, or a nylon scourer if stubborn, and warm, soapy water. Please store cookware in kitchen cabinet or on rack when not in use. For daily dust, wipe with dry cloth.